Hey everybody, it's Truffles! About a month ago Mommy got an email from Rob at PetFlow.com asking if I would like to review a few of their products. I said absolutely because I always enjoy receiving fun new things to try out! 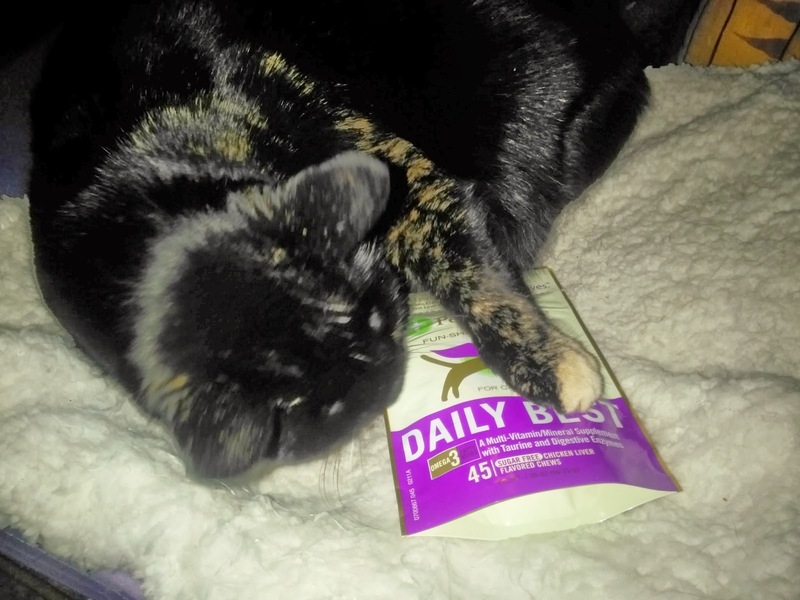 When the box arrived it contained a Cat's Meow toy and Pet Naturals Daily Best Soft Chews. Since I got a Cat's Meow toy for Christmas, I asked Mommy if we could donate this one to our local shelter. 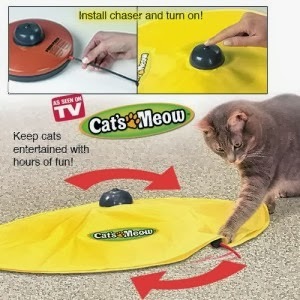 It's a really clever toy that must have been designed by someone who "knows" cats and how we love to hunt! It features a round yellow cloth concealing a hidden peek-a-boo "mouse" which spins around and around, and randomly switches directions and speeds. It even keeps going when you sit on it! It requires 3 C batteries, but we have a money-saving tip...buy your batteries at the dollar store! What do I think about the Cat's Meow toy? Well, I love to sit a little ways away from it and watch it, and I've sat on it too, but I've yet to actually get close enough to swat at the mouse. Don't tell anybody, but I'm a little scared of it! A couple times a week Mommy sets it up for me and thinks that eventually I'll get the hang of it. Many of my kitty blogger friends have had a blast with it so I'm going to keep trying! 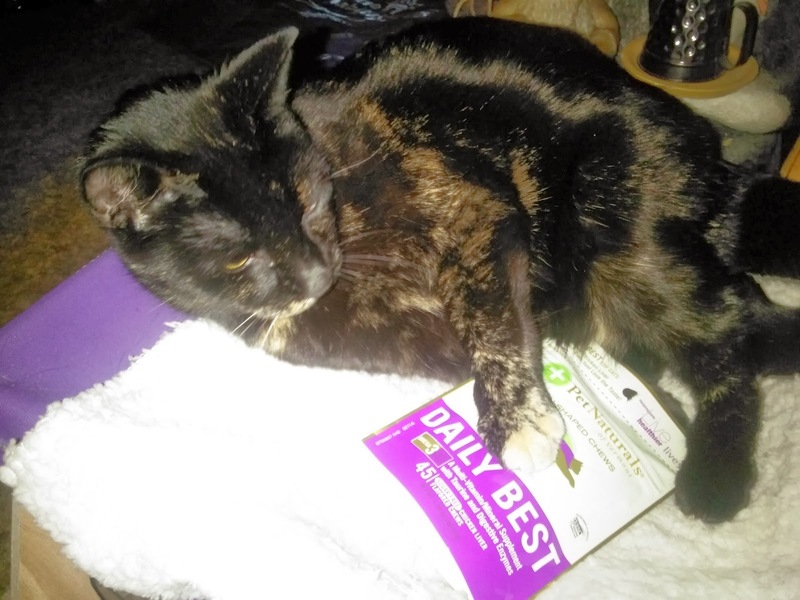 We're *huge* fans of Pet Naturals here at my house. Not only are they a local company, their Calming treats did wonders for me as I adjusted to my new home. 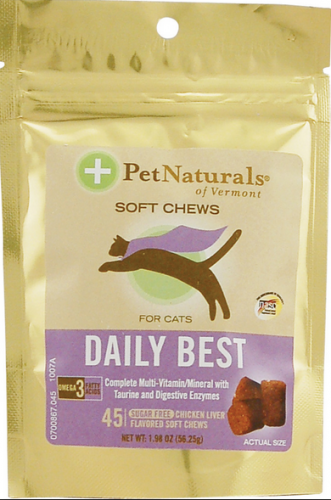 DAILY BEST from Pet Naturals is a multivitamin chew that supports everyday health in cats. So not only are they super yummy, they're good for me too! When Mommy showed me the bag I immediately started chewing on the corners trying to get it open myself! (All she thinks about when I do something cute is grabbing her camera!) Feeding instructions on the package say I get 1-2 chews daily. Is that all??? I practically inhaled the treat Mommy gave me! These treats get 4 paws WAY up! Thank you PetFlow.com for the pawsome goody box! Disclosure: We received these items from PetFlow.com for review; all opinions are our own. Keep trying, Truffles! Just smack it. You'll catch that jerk mouse eventually. - Crepes. We had one of those Cats Meows when it was called Undercover Mouse. We loved it so much we broke it. You should give it a try, Truffles...it's loads of fun! Those treats sound good...we'll check them out! I don't know Truffles...I'd be scared of that mouse too! I'm so scared of EVERYTHING that Mum's going to check out those Calming snacks for me. Those treats look totally nomilicious! We've never had one of those toys - we're not sure how we'd react to it either! I never took to the Cat’s Meow thing and we don’t really have enough room on the floor for it. Every time I give one away, another one appears like magic. She’s also cheap about the batteries. Regarding the Cat's Meow...Piper suggests putting a few sheets of tissue paper on top of it. He says that everything is better with tissue paper...that's why we're not allowed to throw it out at our house but have it draped across his tunnels' entrances...all over the floor and atop the Cat's Meow. It makes everything more mysterious and that crinkly noise is the best when you pounce!